There are many other dogs sports you might like to try with your Callicoma kelpie. They excel in dog sports! Other dog sports include endurance, dances with dogs, dockdiving, flyball. If you wish to get involved with any of these with your Callicoma Kelpie let me know and I am sure I will know somewhere for you to train, or someone to get you started. Keep scrolling down and you will see Callicomas that compete in most dog sports. Ruby won the most successful sports dog in the kelpie club of NSW in 2014 and Whist won it in 2015! Some Callicoma kelpies trial in Endurance, which is where your dog has to run 20km in two hours. You are allowed to ride a bike 🙂 ! The dogs are vet checked before and after the ET and also twice during it. They also have to complete a short obedience test before and after the ET to show they are still as willing to work after running 20km as they were before. 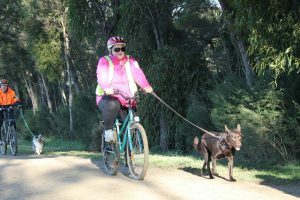 If you wish to do an ET with your Callicoma kelpie they will not need much physical training as 20km is not hard for a kelpie, but will probably need to be taught to run along side your bike. Dances With Dogs is a sport where you choreograph a routine to music using obedience moves and tricks. Some Callicoma kelpies have been very successful in Dances With Dogs. Flyball is becoming popular, but at this stage clubs are only training it in the big cities, no rural areas 🙁 Dogs compete in relay teams jumping jumps and collecting a ball and jumping back to their owners. Dock diving is a sport where dogs jump from a dock into water and try for the longest jump and the highest jump.